Today–Easter–God reminds Christians that in spite of any temporary evidence to the contrary, goodness, love, courage, and life are eternally more powerful than all the evil, suffering, injustice, and death which the world also contains. The triumph of resurrection over crucifixion occurs not only when our final breath leaves us, but every day in those places where hope comes back to life, courage acts, goodness happens, love is shared, beauty created, life treasured, injustice righted, and light glows in the caves of despair. 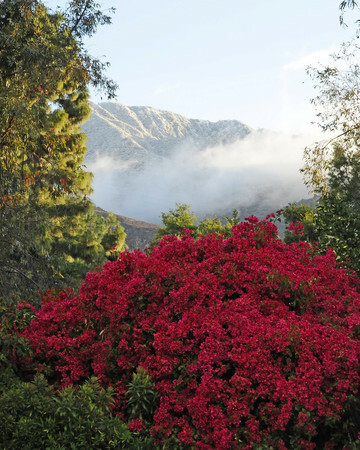 Walking at the base of the San Gabriel Mountains this morning, I sang my favorite Easter hymn and decided to share it with you before I go to church in a few minutes. I pray you will have a blessed Easter if you are within the Christian faith tradition; and if you are not, I pray that as you see the fritzy glizt of our Easter bunnies and chocolate, you will still be touched by the universal truths to which the core of Easter speaks. This entry was posted in Faith, Life in General, Resilience and tagged Christianity, Easter, hope, Resurrection on March 31, 2013 by Barbara Anderson.